I love this piece written by Shane Hegarty, the Arts Editor of the Irish Times. It was published fittingly on the day I began my island adventure so I'm only getting around to including it on this blog now. ALONG THE city-centre stretch of the River Liffey, there is human life. It is over it, alongside it, but not on it. Absence is the norm, emptiness the expectation. The Liffey belongs to shopping trolleys and weeds. Let them have it. Apart from tragic events, humans hit the water only during the annual swim – and the Liffey is sprayed off them quickly when they emerge. The occasional sight of people travelling through the city by boat is a novelty, something that turns heads. Even the squat, sleek tourist boat hides its passengers from public view so that it might as well be a large toy, skimming down the river by remote control. When The Irish Times ran a postcard competition recently, many of the hundreds of entries were variations of Dublin’s dockland scenes. But they were mostly of glass and steel, buildings and bridges. The river was a passer-by. Yesterday, though, the artist Fergal McCarthy’s man-made temporary island appeared in the Liffey, to the west of Samuel Beckett Bridge, in the financial district, equidistant from each (river)bank. Weather permitting, he will live on it for a week from today. The island is in the middle of the river because that’s far enough from any mean-spirited soul who fancies lobbing something at him while he’s there. It is close to the IFSC as a point about the source of Ireland’s current crisis. Its palm tree and hammock mock the notion of paradise, and McCarthy’s occupation of the island plays on the idea of our island as adrift. Part of the Absolut Fringe festival, McCarthy’s project is titled No Man’s Land and follows previous Liffey-themed adventures. 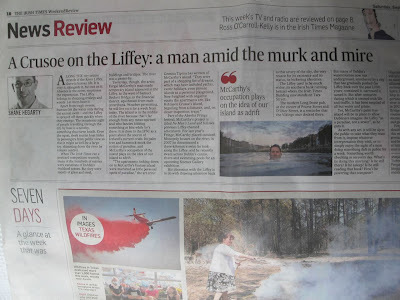 For last year’s Fringe, McCarthy placed outsized Monopoly houses on the river; in 2007 he documented a three-kilometre swim he took along the Liffey; and he recently swam across Dublin’s canals, rivers and swimming pools for an upcoming Science Gallery exhibition. His obsession with the Liffey is to do with drawing attention back to this artery of the city, the very reason for its existence and its status, its bickering identities. The Liffey used to be much wider, its southern bank running behind where the Irish Times Building now stands on Tara Street. The modern Long Stone pub, at the corner of Pearse Street and D’Olier Street, is a reminder that the Vikings once docked there. But many of Dublin’s watercourses now run underground, smothered by a city that has gradually pushed the Liffey back over the past 1,000 years; contained it, narrowed it, tamed it. But after centuries during which it teemed with life and traffic, it has been emptied of all but water and grime. Yet, McCarthy’s palm tree island will be in place to allow Dubliners imagine the Liffey “as a paradise, not a sewer”, as he puts it. As with any art, it will be up to the public to take what they want from it, impose whatever interpretation they wish, or to simply enjoy the sight of a man doing something daft in public for a week. Something worth checking in on every day. What’s he doing this morning? Is he still there? Is he asleep? Is he still reading that book? How’s he powering that computer? Hopefully, then, No Man’s Land will bring Dubliners out to enjoy its novelty, its cleverness, its silliness. Think of the final sections being placed on the Spire; Dorothy Cross’s 1998 Ghost Ship in Dún Laoghaire or, more pertinently, the city turning to the river to greet the Viking longship in 2007 and Samuel Beckett Bridge in 2009. In the deadening routine and rush of the city, such moments can bring a bit of magic and giddiness to a city. 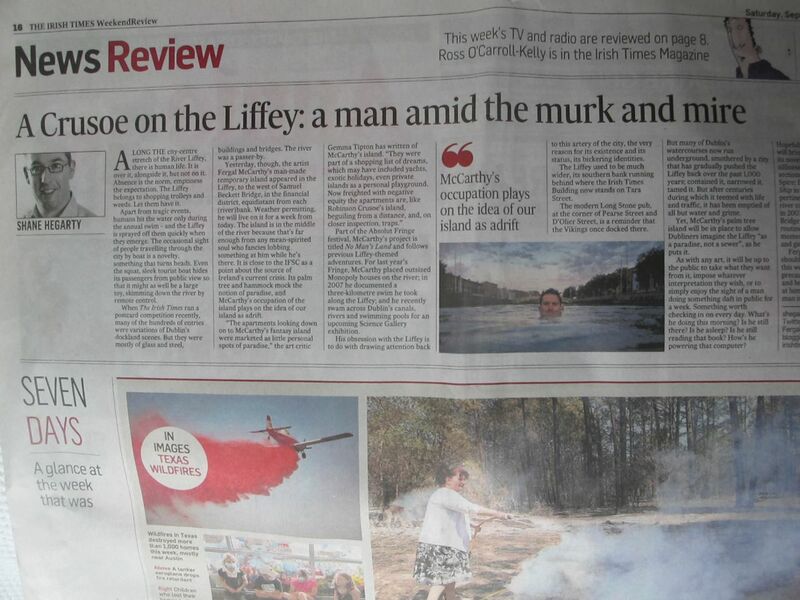 Fergal McCarthy’s Liffey island should bring that to Dubliners this week. And for all the precautions, let’s be optimistic and believe the only thing thrown at him will be a thousand “no man is an island” quips.